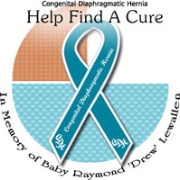 Congenital Diaphragmatic Hernia (CDH) is a birth defect that occurs when the diaphragm does not fully form around week 9-10 of gestation. This can allow some of the abdominal organs to move into the chest, preventing normal lung growth and possibly also causing damage to the heart. This defect happens in about 1 in 2,000 births. Unfortunately, CDH is a rather unknown birth defect that most people don’t hear about unless their baby is diagnosed with it. CDH happens at about the same rate as cystic fibrosis and spina bifida. Many hospitals aren’t equipped to treat CDH babies. They either don’t have surgeons who can perform the hernia repair surgery or they don’t have an Extracorporeal Membrane Oxygenation machine (ECMO) which is a heart lung bypass machine that is sometimes used in treatment of these critically ill babies. Our local hospital could not provide the proper care and so we traveled to Legacy Emanuel Children’s Hospital in Portland for our son’s birth and care. The survival rate for CDH babies is around 50%. At Legacy and other hospitals that use the gentle ventilation technique for treatment there is a 92% survival rate for babies that don’t need ECMO. Some babies with CDH also have other birth defects, affecting the heart, chest wall (pectus excavatum) or spine (scoliosis). There are also some chromosomal abnormalities that can occur with CDH. Some babies, however have only the CDH and no other structural or chromosomal abnormalities. So many little ones that are born with CDH have lasting problems. Often the lungs don’t grow to normal size or function so babies may still need the help of oxygen or other lung medications. Other common problems are with feeding, from acid reflux to oral aversion and problems with weight gain. Some babies also experience different developmental delays from extended hospital stays or ECMO and the side effects of different medications. Below are some different links for information and resources on CDH. There are also more links on the sidebar on the right. I wrote Owen’s story and it is posted on a really cool website called BeNotAfraid. This website is for people who have been given a poor prenatal diagnosis. There are a couple of CDH stories as well as many other amazing stories about some incredible kids and their parents. We just recently mailed off samples of Owen’s, Danny’s and my blood for a CDH research study that is being done at MassGeneral Hospital for Children and Children’s Hospital, Boston. The woman that I have worked with is named Meaghan (her info is at the above link). I have had such a good experience so far with this (except for Owen’s blood draw, of course). But I would highly recommend looking in to this. We are far away but it has not been a problem to submit samples and paper-work. It has also been quite reassuring to talk with someone who deals with several hundred CDH folks and knows what is “normal” or not. There are a ton of blogs where people (usually moms) write about their lives with a CDH survivor or CDH angel. On my main page I have listed many CDH blogs that I check regularly and that give a good idea of life with CDH. One blog in particular is really good. Jenn is a labor and delivery nurse who has a little girl (Sofia) with CDH. Her blog is so well written and explains so many CDH terms and issues in understandable language. Please take a moment and click on over there, I especially recommend this post, which accurately describes some of the emotions, etc. that go along with this whole CDH experience. Sofia’s blog has lots of CDH info and many more resources. My name is Tran – 30 years old, from Vietnam. I am very depressed now because I don’t know how to treat with my pregnancy. Now, I am in 22 week – pregnant. When I took 2 times of ultra sound (4D) in 19th, 21st week, my doctor found out that my baby has Congenital diaphragmatic hernia (CDH) with one stomach locates behind the heart. I feel very despressed & upset when knowing that. Before having pregnancy, I & my husband already checked Chromosome & the result has no problem. During 18th week pregnancy, I also took tripple test & the result is good. My wonder is whether I can keep my baby or I have to abort him/her ? The doctor said to me there’s only 50% for my baby if I keep. Because he fear that the baby will die after delivery, so there’s no choice to save him. If we are luckier, the child will be OK after delivery & we have a chance to save him/her with a super operation. I feel very dispointed with this life since I got 2 times of unsuccessful pregnancy before (one in 2007 with 9 weeks of pregnancy, there was no heart-sound, one in beginning of 2008, due to too much amniotic fluid (sorry I don’t know this word), my baby could not live after premature delivery with 7 months). I understand that my pregnant history is very bad but please help to give me your advise of how to treat with my baby this time. Should I keep or should I abort? Thank you for leaving a comment, I am so sorry that you are facing this diagnosis. I am sending you an email to help answer some of your questions. It should be in your email soon. I heard your story and just wanted to let you know that I understand your devastation and concern. But, I have a son that was born with CDH. Which was undiagnosed until he was born. He went through a traumatic start, and we were given the 5o% survival rate. But he did remarkably well. The hernia was repaired 3 hours after birth and then we waited. His pulmonary hypertension quickly stabilized and he didn’t even need ECMO. He was able to leave the hospital a mere 2 weeks after he was born. He is a true living, breathing MIRACLE!!!!!!!!! God gave you that baby for a reason. He has a plan for you and that baby. I cannot imagine what you are going through knowing what faces you and your unborn child, but I do know that my Jackson is the most amazing part of my life. Please consider your baby. My email is stormynicole@cox.net if you would like to chat. My 22 yr old daughter is 24 weeks pregnant with a very sick little baby. He appears to have a right sided CDH (liver down thenk God), right lung pretty much out of commission & very questionable left sign function. Every ultrasound is bad, she is is very depressed & has been having alot of additional complications due to an unrelated prexisting medical condition. She feels very alone & would like to talk to someone here in the Portland area that can give her some hope. We are also very concerned about her delivering at Legacy Emanuel. OHSU felt it better for her to go there as they are almost positive he will need ECMO, but our first consult there last week left us with the feeling of the OB part of the equation as being uncaring, snobish, snotty, condecending, inept & incompetant. She is to the point where she is considering saying she will deliver at OHSU & if he needs ECMO then transport him across town. No final decision has been made yet but if the next visit doesn’t go better I will back her 100% as I had the exact same impression, she just said it before I could. Someone please reassure us that having him at Legacy is a good decision!! OHSU treats us as partners in our health care & we did not feel that at all at Legacy. She also has an underlying heart condition that is stable at the moment but after what the snotty doctor said about knowing any cardiologist knowlegeable about her type of condition…. If she dies in delivery & he does not make it…. At least she has cardiologists & hemotologists at OHSU that we trust!! Sorry for the rant but she is scared for her little boy & I am scared for both of them. Any info on Legacy’s competancy with severe CDH is greatly appreciated in advance. I am so sorry that you and your daughter are facing this terrible diagnosis. I have just sent you an email. Please leave me another comment if you don’t get it for some reason. Thanks for all the support. Things are improving somewhat with the Legacy Maternal Fetal Medicine side after we called them on the carpet, Legacy’s L&D team is ok (she has had a couple of threatened pre-term labor episodes after another full blown one was stopped at OHSU just last week), NW Newborns were great & Dr Bliss is a BLAST! He seems very hopeful of a good outcome & thinks there is a chance he may not even need ECMO. I think we may have seen you at his office just before our appointment. It was very reassuring to see a doctor that has such a great love of kids & can still relate to the parents on a personal level too. We know there are no guarantees, but he does give a feeling of confidence that we can make it through the trials ahead. As nightmarish as this has been since about week 18 (actually week 14 if you count a “screen positive” nuchal translucency screening test) it now looking so much more promising now a especially after passing his hyperoxygenation test & that she has made it to week 34. To the readers – Correction: The baby has a left sided CDH with the heart being pushed to the right. I typed it late at night & got a bit dyslectic. Unfortunately my wife and I are experiencing the very same conditions you all have gone through. My wife is British and I`m an Iranian. We are expecting a daughter, not only with CDH but now even with a mild Ventriculomegaly. We live in Dubai, the UAE, but since we realized the problem, we decided my wife to move to England (with her parents) to benefit from a more advanced and entrusted health system. Since it is not the best time to be an Iranian, I am still fighting for a UK Visa to join her and to make it more bearable for all of us to walk this path. Although the Physicians were unwilling, I was able to catch them once on the phone and to talk to them directly. Anyway, long story short, I was thinking about all + and – and the possible scenarios for now and even years later to come and what we can/should do…this is when I came across a crazy question which is totally unrelated at the moment !! Could anyone please tell me, if hopefully the baby girl survives all the difficulties of the CDH and the upcoming problems, and grows as expected…would the Diaphragm, heart, lungs and the body overall be strong enough to allow a pregnancy experience for herself?? To be honest I have collected and created my own lexicon of CDH and its effects on an individual and this seems to be the only question left unanswered. So please help me to get this clear as well.